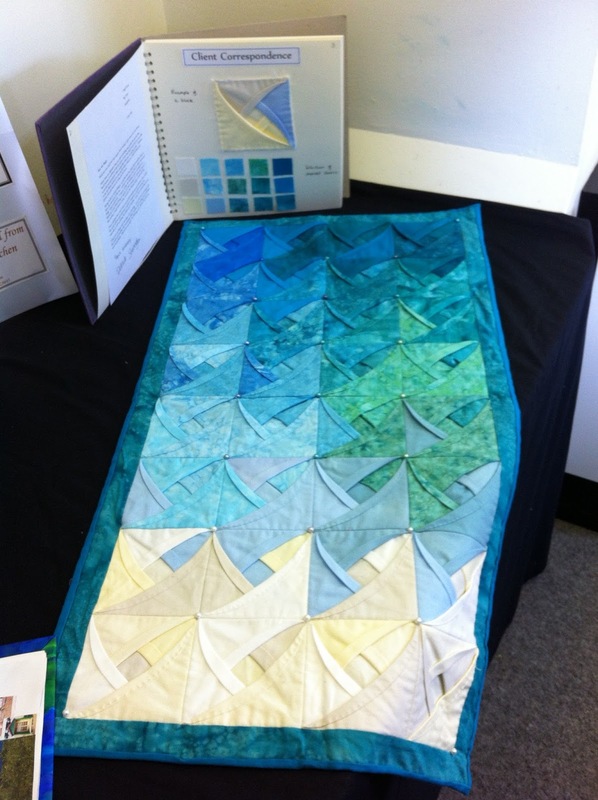 Roundabout Quilters: How it all started. We are a new quilting group so I thought I would just share the story of how we came to be. In September 2011, I started a City and Guild course in Patchwork and Quilting in Odiham, a course taught by Hazel and Terry (who incidentally have kindly agreed to be our first speakers). I had done 4 leisure courses before but wanted to go beyond the basics and actually make something! I had a load of notes and samples but only one quilt which I made at my first ever course, 15 years ago. It was a Christmas sampler quilt which doesn't see the light of day for 50 weeks of the year. In between courses I didn't have the confidence to make a quilt by myself so the bag full of samples stayed a bag full of samples and got left at the back of the cupboard. On the course I met Jude who is the Roundabout Quilters chair this year. She was very keen to join a quilt group but found that there wasn't anything local that didn't have a waiting list. For various reasons I couldn't go to the group anyway so we hatched a plan to start our own! To be honest, I didn't think we would actually do it - it seemed a bit daunting really, but thankfully Jude is not easily put off and at the end of our course we started work on Roundabout Quilters. Now we are coming up to our first meeting and I am fretting about whether anybody will show up! It is a bit like having a children's party and wondering if anybody will turn up or whether we would be here with a mountain of party food and no children. Of course they usually do show up so I hope we have a good meeting next week. Just to liven up the post, I have added some pictures of our assessed pieces for City and Guilds, taken at our exhibition. This is my table runner - non-block using Japanese folded squares. This is my quilted bowl machine and hand quilted on silk. This was Jude's final quilt - bed sized and all made with hand dyed fabric. Not the best photo I am afraid. It is so big I had trouble getting it in the frame! A few of my samples. This was Jude's pieced wall hanging.